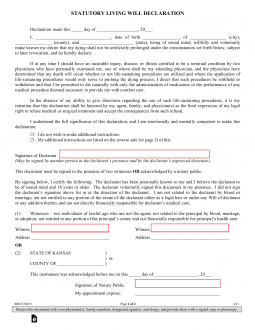 The Kansas Living Will Declaration will generally state that if you are terminally ill, then the Declarant/Principal may choose to put into writing, that death-delaying procedures are not be used to prolong the life of the Declarant/Principal. The document provides plenty of specifics to be certain that the Declarant/Principal received exactly the medical treatment that they prefer, leaving no one else to have to make difficult decisions with regard to their loved one. If you’re uncertain how this document will work for you, you may wish to consult with an attorney, prior to implementation. Medical Power of Attorney – For the option of having a person who can make decisions on the behalf, and best interest, for health care reasons if they cannot do so for themselves.